15 May Wanna be there?? May 23rd – June 2nd 2014. The Conamara Bog Week Festival 2014 is an authentic, award-winning festival celebrating 30 years. The festival aims to provide a space for walking, talking and fun in the company of a multi-disciplinary team of poets, painters and musicians in the wondrous Conamara landscape. This ten day, fun packed festival celebrating Letterfrack, with lots of great music and buckets of fun for all the family. Active participation for all ages is a hallmark of this festival – whether it is walking, running, talking, dancing, painting or making music, there is something for everyone. 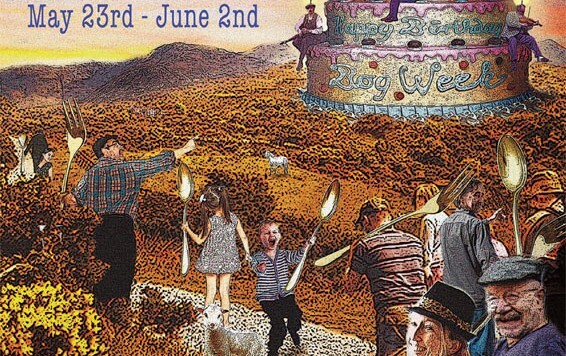 Family Fun Day Sunday May 25th with its Fun Run, Fun Sports, Gig Rig, Cookery Demonstrations, Cake Sale in aid of Letterfrack PA and highlighting three old events – 56lb Weight, Sheaf Throwing and the game of Cad – all wrapped in brilliant music. CD Launches – launch of two brilliant albums from local singer Eileen Keane, Currywongaun and also a new album from well known Co. Clare box player Conor Keane. Parish Walks – exploring our place with high quality guides. Art Exhibition – featuring the work of Tanya Doyne and Tommy Casby. Kylemore Concerts – a beautiful venue for some wonderful concerts. Establishing a Poetry Trail linking Connemara National Park with the village of Letterfrack – a first in this country. Nine eminent poets, nine plaques with a poem on each exploring aspects of ‘Place’. Be at the heart of the event - book your accommodation at the Old Monastery Hostel!! !